Another Reason to Dump DREs? Bradblog reports that undervotes by Latinos and Native Americans plummetted after New Mexico shifted from DREs to optical scan paper ballots. Undervotes are when a voter went to the polls and cast a ballot but no vote was recorded for an office. Democrats should check out these results and consider their implications as both of these groups tend to favor their party. County Council Town Meeting on Wed. The Montgomery County Council will be holding a town meeting on Wednesday at Francis Scott Key Middle School in Silver Spring. Hat tip to Kevin Gillogly for the info and the link. Monday February 26, 2007: Congressman Chris Van Hollen had a Town Meeting in the Kennedy HS cafeteria. It was an overflow crowd of 300+. Not the same type of crowd as was at the Leggett Town Meeting at Northwood a few weeks ago or even the O'Malley event at Einstein last month. This was issue-based advocacy and few--if any--civic federation activists. My first clue was walking in the parking lot outside of Kennedy. Several cars had bumper stickers that were anti-war and calling for the impeachment of Bush and Cheney. There were home-made signs stating anti-war positions plastered on seemingly every wall of the cafeteria. Former US Senate candidate, Kevin Zeese, was there and it seemed as though most of the vocal folks there were anti-war folks that he helped draw to the event. It had a Green Party/Populist Party feel--in part-- to it. There was a film crew that at first seemed to be from Chris' office. It was not. It was "an independent media" group that seemed to be tied to the antiwar activists. The Police Chief was there standing quietly in the back. No other elected officials. Perennial candidate Deborah Vollmer was there. So was Alec Stone, a former District 19 Candidate for Delegate. Questions were on immigration (why don't those folks learn our language type), personal grievances and personal advocacy -- Childhood Arthritis, Haitian Democracy, etc. There was one guy who was anti-North American Union of US, Canada and Mexico (as if anyone in the crowd would in favor of it). He was later seen handing out the New American, a John Birch Society publication. The most dramatic event was a group of Military Families who are against the war. They are called Military Families Speak Out. Five members of the organization stood up when they made their plea to bring the troops home. The speaker was a mother whose son was killed in Iraq. Chris had attended his funeral. The last questioner finally brought up the passing of Chris' mom last week. Chris' 84 year old father--Chris Sr.--sat in the front row for the duration of the Town Hall Meeting. Still of the fifteen or so questions around half were on the war and ways to bring them home. Some pointed out that Chris had supported funding for the war and were against that. Chris' position has been to follow the bipartisan Baker-Hamilton Commission Report. There was a GOP partisan who asked some question that was pro-Bush; a close look at her notebook revealed a Gov. Ehrlich color brochure. She was neither strident nor overbearing just pointing out a difference in opinion. The anti-war crowd neither hooted nor hollered at her, as was the case at the O'Malley event when someone outside of the norm spoke. At the beginning of the meeting, the congressman informed the audience that his mother had passed away before starting his opening remarks. We could see that it wasn't easy for him to be there, but he said his mother would have wanted him to go ahead with the meeting. The audience was sympathetic, but did ask plenty of questions - mostly about Iraq. Many people wanted him to cut funding for the war, but he said a funding cut would not get past a filibuster or veto. Still, Van Hollen emphasized his vote against the war and said he would do whatever he could to get us out. Regardless of the content of the meeting, Van Hollen deserves a ton of credit for seeing us under such difficult personal circumstances. Congressman Chris Van Hollen's mother died on February 21st. Read about her life in the Washington Post. The Mid-County Citizens Advisory Board has selected Crossing Georgia, a subcommittee of the Forest Estates Community Association as its "Civic Association of the Year." In addition, Adam Pagnucco has been selected "Citizen of the Year". I can't say I am too surprised by this one. Adam has pushed hard and very effectively for the tunnel in person and on the web. Shoot, he and his organization have done everything but dig the thing themselves. Congratulations on some well-deserved recognition. One piece of good and one piece of bad news for supporters and opponents of the Purple Line. Transportation Secretary John Porcari announced the Environmental Impact Study (or is it Survey?) will be delayed by a year for the Purple Line so the timetable for moving on that project has been moved back by at least a year. And don't forget that next year is when the rubber will meet the road in terms of figuring out how to deal with the State's exisiting structural deficit even before we figure out how to pay for new transportation projects. Apparently, there was also a glitch in doing the math on the ridership estimates. Porcari says that projected ridership is 20-25% higher than originally suspected for the Purple Line. Of course, 20-25% higher than exactly what number is rather critical to whether this is a viable transportation project but Purple Line supporters undoubtedly regard this report as good new. Nevertheless, Porcari appeared to throw cold water on the ridership of the Purple Line in an interview with the Gazette despite his past strong support for the Purple Line. The General Assembly is now nearly to the halfway point of the 2007 legislative session. It has been a slow year in the Senate so far. The next 45 days should be especially busy. I would like to give you a brief update on some of the state transportation improvements expected in our district. But first I would like to share with you my good family news. As you may know, in mid-January, Mark, Katie, and I welcomed a new addition to our family – a baby boy named Jackson. He is a healthy and happy two-month old who has already been to Annapolis to lobby on two occasions. I am confident Ana, Jane and Jeff listened to his concerns. I am pleased to report that the District 18 Team has been working together well and meeting frequently. We recently met with the District Manager of the State Highway Administration to review projects in our district. Over the next 18 months, SHA will be working on a number of construction, repair, and planning projects in our community in which I thought you would be interested. Several of these projects involve Georgia Avenue. Most important among these is a plan to widen the exit ramp off the eastbound Beltway (Inner Loop) onto southbound Georgia Avenue, which currently merges into a very short right-turn-only lane. This project will also include the installation of a traffic light at the end of the ramp. This new configuration should reduce traffic backing up onto the Beltway. SHA expects to complete the project during the summer of 2008. Along Georgia Avenue between the Beltway and 16th Street, the old overhead reversible lane signals will be modernized by the end of spring. SHA will be eliminating the yellow X symbol, which they have found many drivers do not understand. In the Chevy Case area, SHA is planning to modify the sidewalk and road in front of BCC High School, facing East-West Highway. SHA will be replacing the existing sidewalk in front of the school and the two interior walkways leading into the school with a new ten-foot wide sidewalk parallel to East-West Highway. A new fence will be built between the sidewalk and the school, which will alter the way that students walk into the school. SHA will also be installing a permanent median along East-West Highway in front of the school. They expect construction to occur this summer. SHA is also coordinating with officials in Chevy Chase Village on a project involving the sidewalks along Brookeville Road. SHA also discussed two projects in Kensington. First, SHA is currently studying ways to improve traffic flow through the town of Kensington along Connecticut Avenue, Knowles Avenue, and Plyers Mill Road. Part of their study involves tracing in detail the frequency of different routes taken by drivers once they enter Kensington. This information should help planners address the town’s traffic problems. Also in Kensington, SHA plans a landscaping and median beautification project along Connecticut Avenue and University Boulevard to the Kensington town limits. They anticipate construction this fall. SHA is also planning some major road resurfacing projects. By this fall, they expect to complete the resurfacing of Georgia Avenue from the Beltway up to Veirs Mill Road. SHA will be resurfacing Georgia Avenue from Veirs Mill Road to Randolph Road starting this summer, with construction due to be complete in the fall of 2008. In fiscal year 2008, SHA expects to resurface University Boulevard between Veirs Mill Road and Connecticut Avenue. Finally, this fall, SHA will be installing new full signals at the Connecticut/University split and at the Georgia/Veirs Mill split to make it easier for pedestrians to cross at these intersections. Gov. O'Malley is continuing to surprise. For a man who was entering his term being urged to be more aggressive in using his political capital, he is turning out to be quite surprising halfway through the legislative session. While other governors have called for a moratorium on the death penalty, Gov. O'Malley has gone one step further and called for its abolition. While Gov. O'Malley's support will undoubtedly be crucial to any effort to abolish the death penalty, its opponents cannot help but notice that the strong efforts of Sen. Lisa Gladden in moving this issue forward. Bonnie Cullison, the President of the Montgomery County Education Association, the Montgomery County Teacher's Union, will be the guest on "Political Pulse" on Thursday, February 22nd at 9 p.m. and Tuesday, February 27th at 9:30 p.m.
3. The power of the Apple Ballot, which outlines the endorsements of MCEA, at the polls. Ms. Cullison also is the Chair of the Committee for Montgomery. "People talk as if this is, like, some kind of option for him," Cobb-Hunter said. "When Obama looks in the mirror in the morning, what do you think he sees? There is no way that he has any confusion about being a man of color. I think this issue is being manufactured by people who want to get us off focus. I don't hear the national media questioning Hillary Clinton about being a woman." But what about the argument, posed by a couple of contrarian black columnists, that since Obama is not the descendant of slaves (white mother from America, black father from Kenya), he's a different kind of African American? "As time passes, very few people are going be able to say they marched in the civil rights movement," Cobb-Hunter said. "Are the people asking this question saying that if you didn't live through the Civil War, you can't understand slavery?" Marcus Smith was working as a waiter at a Democratic fundraiser here the other night when Sen. Barack Obama (D-Ill.) took to the podium. Smith, with dishes in both hands, stopped to listen. "I'd really like to see Obama become the first black president of the United States," he said later. Asked what made Obama black, he replied, "That little taste his father gave him was all it takes." I suspect the main people questioning Obama's black credentials are people who are think that his major failure as a black man is that he didn't kow-tow enough to them or their agenda and that bludgeoning him with the racial stick might change that. An observant politician might notice that ignoring these sorts of people only caused Bill Clinton to soar higher in the polls in 1992 and did not prevent him from being acclaimed America's first black president by Toni Morrison. Obama would be wise to do the same. Of course, Obama came to national attention with his soaring rhetoric at the 2004 Democratic Convention about bringing this divided nation together. Accordingly, What the World Needs Now seems to fit Obama's ideas and politics perfectly. Moreover, it a song that is "black enough" (whatever that means) to be sung by Dionne Warwick and Ruben Studdard, and "white enough" (whatever that means) to be sung by Clay Aiken. Because the best way to reduce gases is to use less fuel, the legislation would require vehicles to be more fuel efficient. The law is designed to raise the state's average fuel efficiency for new vehicles sold in Maryland to 43 miles per gallon. The current average for light trucks and SUVs is 22.2 mpg and for cars, 27.5 mpg. Five years ago, California became the first state to regulate emissions of carbon dioxide from car tailpipes. The higher standards are to take effect in 2009, but the auto industry has sued that state to block them. Maryland lawmakers -- mindful of cancer rates, asthma and rising water levels hastened by climate change in the Chesapeake Bay -- are pushing a slew of clean-energy initiatives this session. "It's a big day," House Speaker Michael E. Busch (D-Anne Arundel) said, estimating that the Clean Cars Act would take the equivalent of 190,000 vehicles a year off the road. "People for years wrote off climate change. Now they're seeing things like Hurricane Katrina, tsunamis, and they know the causes of melting ice caps have credibility." The 122 to 16 House vote included Republican support and reflected the power of the state's environmental movement after passage of legislation last year to curb pollution from coal-fired power plants. O'Malley highlighted clean cars in his State of the State speech last month and embraced the measure in his first-session legislative package. "He thinks we have a responsibility to lead the fight against global warming," spokesman Rick Abbruzzese said. The Senate appears ready to follow suit and Gov. O'Malley will sign the legislation. In a very short time, Maryland Democrats have moved aggressively to reduce our energy dependence on imported oil, and thus our indirect funding of terrorism, in a manner that the Bush Administration should have been pushing since 9/11. If this is O'Malley's choice of his big gift this year to liberals, I approve. Residents in the Chevy Chase neighborhood of Rollingwood matched wits at a hearing on proposed incorporation Monday night, during an impassioned two-hour public debate. More than 40 speakers, evenly matched in support and opposition, rose to address a packed auditorium at the French International School on Woodbine Street. The audience included roughly 250 neighbors who are heading toward a possible referendum vote on incorporation. ‘‘Since this came up, I found out that some of my neighbors who I thought were Shi’ites are really Sunnis,” joked Ted Rockwell of Woolsey Drive. 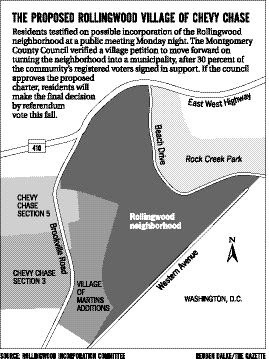 Some think it is time for Montgomery County to withdraw from this battle and cede Rollingwood to the District of Columbia--pointing out that the contentious territory already adjoins Chevy Chase, DC. However, County Executive Ike Leggett attacked such talk as giving comfort to the enemies of Montgomery County and promised to provide good government from Rockville or help the plucky subdivisions set up their own autonomous regime after a plebiscite on the matter. Linda Lamone and Jimmy Carter have agreed to monitor the Rollingwood's first democratic election since the outbreak of the conflict. Dan of Just Up the Pike has a howling send up of local sterotypes and communities. The easily offended should not click on the link. He also did an interview with County Executive Ike Leggett. Dan is no fan of our new Exec but concedes that he is a "nice guy." Today, the Maryland Senate approved a constitutional amendment which would allow early voting in the State of Maryland. Despite Republican squawking, it passed 31-16. Now, it should go before the voters in 2008. Thanks to Scott Tsikerdanos in Sen. Rich Madaleno's office for providing the information on the vote. Read about a great initative launched by African-American parents in Loudoun County that probably has more potential to help close the racial achievement gap than any government effort as parental interest is one of the key predictors of student accomplishment. Apparently, the NAACP Parents' Council in Montgomery has organized a somewhat similar Sunday Scholars program. As the presidential primary campaigns are only days away, it seems like it's time to start thinking of campaign theme songs. Today, I start with Sen. Hillary Clinton because the choice for her just seems obvious. Sen. Hillary Clinton memorably said during her husband's first run for the presidency in 1992 that she was not "some little woman, standing by my man, like Tammy Wynette." Well, as we all know, history took a strange turn or two and the former First Lady ended up pulling the biggest Tammy Wynette in American history. So it seems clear to me that Sen. Clinton should choose Stand by Your Man as her campaign theme song. Sure, it reminds people of the unpleasant Lewinsky years. On the other hand, I daresay the country could use a reminder of simpler times in the 1990s when whether the president was having an affair was the major problem troubling America. Moreover, it might evoke some sympathy for a woman who increasingly looks more programmed than my Tivo. Of course, Sen. Clinton, who continued her 2000 Senate campaign with fortitude in the face of relentless, ruthless, and just plain cruel questioning about her marriage even when she was down in the polls, perhaps has had enough of this topic. In that case, I suggest Independent Woman by Destiny's Child as an alternative selection. The Charlie's Angels theme song could give her that extra edge on security issues that all the candidates are desperately searching for this year. The corps released a report on Jan. 31 identifying levees in Bladensburg and Edmonston along U.S. Alternate Route 1 and Decatur Street that could break in severe weather and lead to flooding. Inspections conducted in September found trees growing along levee slopes that could pose a problem, said Tony Vidal, chief of civil works for the corps. ‘‘Those trees could form large root systems and if they get knocked out during a storm, the roots could come out and take part of the levee with them,” he said. This is exactly the type of flood you will never hear about if government works because the flood won't happen. Taking care of this problem is an early test for both the Prince George's and Maryland governments. We should join the people of Bladensburg and Hyattsville making sure that this potential problem doesn't balloon into a major catastrophe. Among the department’s responsibilities ‘‘is a strong focus on nuts-and-bolts law enforcement, and frankly we need to rebuild some of that capacity that was stripped by the Ehrlich administration,” Perez said in an interview in his Baltimore office this week. ‘‘In the wage and hour context and prevailing wage context, there was, frankly, an ideological battle, an ideological assault on those units that was unfortunate,” he said. The state had 25 wage and hour investigators in the early 1990s, he said. But funding for the Employment Standards Service was eliminated in July 2005, leaving the department without investigators to check for violations of wage and hour rules, spokeswoman Linda Sherman said. The referendum would be put on the 2008 ballot for voters to decide. Democrats say early voting will increase turnout, but Republicans argue that it is tilted against them and will invite fraud by allowing voters to cast ballots in precincts other then their own. Six GOP delegates joined all voting Democrats in supporting the measure, which required the approval of three-fifths of the chamber. It received 101 supporting votes — 16 more than were needed. ‘‘We’re giving people the right to choose to give us direction on this issue,” said House Ways and Means Chairwoman Sheila E. Hixson (D-Dist. 20) of Silver Spring. By the time I post this, the Senate may well have passed it too as they were scheduled to vote on the amendment tonight (Monday). Rep. Chris Van Hollen (D-Md.) has an additional idea: Opponents of the war need to force full consideration of the original Baker-Hamilton proposals that, he said, promised to put American policy "on a trajectory to have our combat troops out of Iraq this time next year" and reflected "the center of gravity in Congress." Whatever its flaws, the Iraq Study Group report could still serve as a focal point for sharply reducing America's military role in Iraq before the 2008 election. "The refusal of the administration to try to work with others to resolve this in a responsible manner has created a very polarized atmosphere," Van Hollen said. "They've refused to listen to anyone else." That should be the central theme of the president's critics because it's true -- and because it offers the best rallying cry for those seeking to change a disastrous policy. Unsurprisingly, the Washington Post reports that all six Maryland House Democrats voted for the non-binding resolution condemning President Bush's plan to send more troops to Iraq. Eastern Shore Rep. Wayne Gilchrist was one of the seventeen Republicans who defied the party whip and voted with the Democrats on this one. Only two Democrats (Gene Taylor of Mississippi and Jim Marshall of Georgia) voted with the Republicans. Standing in the middle of the Department of Liquor Control’s massive, 175,000-square-foot warehouse in Rockville, among nearly $20 million worth of booze, DLC Director George Griffin is pondering the question posed to him: Given the frustrations of some licensees, what service does the DLC provide that couldn’t be done better in the open, free-market system? The article missed another certain backer of the monopoly: DLC employees. I bet unionized employees for the Department of Liquor Control do better than equivalent store employees in non-control jurisdictions and would unsurprisingly like to keep their jobs. On the other hand, the system may drive business out of the County because people can get better selection and prices in neighboring jurisdictions. Total Wine in McClean, Virginia beats has far better prices and selection than MoCo stores. I wonder if anyone knows if the County would make more money simply levying a tax rather than running the business itself. A safe bet seems to be that DLC employees would strongly oppose the abolition of the current regime but that local restaurateurs would thrilled by it. Admirers credit Weast with effectively balancing the interests of the county's haves and have-nots, attending to language and poverty needs in the eastern swath of the county while simultaneously managing highly organized parent groups in affluent Bethesda and Potomac, sometimes on the same day. Weast credited his team, and himself, with overseeing an era of rising test scores in a school system that is growing more racially diverse. Few school systems accomplish that feat, he said, because of the enduring achievement gap between white and Asian students on the one hand and blacks and Hispanics on the other. "Find me another one, because I'd like to see it," Weast said, after accepting the board's offer yesterday morning. "And I've studied the top 100 school systems." Q: What about expanding the Red Line in Baltimore? A: We want ... consensus. ... We don’t need warring advisory committees [or] counterproductive discussions about what’s appropriate and what’s not. We’ve had some discussions ... [about] trying to combine the two committees. Q: On building the Metrorail Purple Line [between Bethesda and New Carrollton]? A: A more refined model of ridership would serve the project well. Before you get to the specific alignments, the transit modes, you need a better understanding of the ridership potential. A corollary of that is tying it to local land-use plans. We’re working very closely with both Montgomery and Prince George’s County to make sure we are maximizing the potential for transit-oriented development. Q: On Corridor Cities Transitway [a proposed busline between the Shady Grove Metro station and Clarksburg and perhaps Frederick]? A: Maryland Transit Authority has ‘‘request for expression of interest” out to see if there’s any private interest for public-private partnership that would include the Corridor Cities Transitway in the 270 corridor. Q: On building a second crossing over the Potomac River? A: The difficulty is, if it makes sense to have a crossing, finding an alignment that works for both Virginia and Maryland. Our land uses are almost opposite on two sides of the river. Q: On building a Route 301 bypass at Waldorf? A: Some of the worst traffic congestion in the state is in Waldorf. The bypass is sorely needed. We’ve been working with county commissioners on preserving right-of-way for an alignment that works [and is mindful of the environmental issues]. Q: On augmenting Route 301’s Governor Nice Bridge from Southern Maryland to Virginia? A: The bridge itself will need rehabilitation in the midterm. The question is ... whether a parallel span is needed. That’s one of the things the transportation authority is looking at now. Q: On creating ferry service from Southern Maryland to the Eastern Shore? A: It [would] require a substantial operating subsidy. Connecting Southern Maryland to the lower Shore does make a lot of sense ... [but] it’s not clear that ferry service, seasonal or year-round, would be cost-effective. Fascinating that a man known for being a strong Purple Line advocate makes comments that are non-committal to say the least. Does anyone have any idea what these comments mean? Meanwhile, Prince George's municipal officials rallied against the ICC and for the Purple Line. A light rail train driver and five passengers were taken to hospitals with minor injuries after the train and a tractor-trailer truck collided yesterday in Hunt Valley, authorities said. The train was derailed by the collision, leading to an interruption of service in the area. The truck driver was traveling south on Gilroy Road near Schilling Circle about 10:45 a.m. when he made a left turn to cross the tracks, according to Maj. Stanford Franklin, a Maryland Transit Administration police spokesman. The driver is accused of failing to heed a sign that lights up as trains approach, prohibiting left turns at the crossing, MTA officials said. The sign was functioning at the time of the accident, the officials said. Of course, Rove's explanation for his remarks makes no sense so one suspects that the presidential advisor was understood perfectly well the first time around. Michael Wilbon . . .
. . . once again shows why this particular sports columnist is one of the more savvy and smart writers on discrimination issues. He takes on the issues of gays in pro-sports today. Democratic Sen. Rob Garagiola (District 15) received the kind of positive coverage from the Gazette this which would make a presidential candidate drool. In the article, Garagiola is variously described as: "hardworking", "a nice guy", "one of the fastest rising stars", "superstar", "role model", "young and focused", "thoughtful", "responsive", and "up and coming". The Gazette has him simultaneously succeeding Mike Miller as State Senate President and replacing Chris Van Hollen in Congress. The campaign to build a tunnel under Georgia Ave. by the Forest Glen Metro station has received several major boosts lately. Adam Pagnucco, a leader in the fight for the tunnel, reports that the County Council included the project as part of its official transportation request to the County. The District 18 legislative delegation (Sen. Rich Madaleno, Dels. Ana Sol Gutierrez, Jane Lawton, and Jeff Waldstreicher) have also written letters backing the tunnel. Maybe one day soon, residents of Forest Estates and workers at Holy Cross Hospital won't have to play a live version of Frogger to get to the Forest Glen Metro. If the Purple Line is built along the Capital Crescent Trail between Bethesda and Silver Spring, then the next logical step is to continue the light rail along the Capital Crescent Trail to River Road⁄Massachusetts Avenue⁄Westbard. After all, the goal of light rail proponents is to continue the light rail to Tyson’s Corner, and where else can it go but down the trail? Will state Sen. Brian Frosh support a light rail to Westbard? Or are the trees and trail more precious in his neighborhood than in ours? Because African-American men not only are fewer in number but also register and vote at much lower rates, black women cast almost three of every five of these votes - 59 percent, to be precise. White women also outnumber, out-register and outvote white men, but the disparity is smaller (53 percent to 47 percent). Two factors help explain why black women outvote black men and a stronger rate than white women outvote white men. Education is the strongest predictor of who votes. Unlike among whites, women are better educated than men in the African-American population. Felon disfranchisement also plays a role. Several states with sizeable black populations disfranchise people with felony convictions. A disproportionate share of blacks, especially black men, have lost their voting rights as a result. The Washington Post covered failed Republican efforts to change the rules of the Senate to make it easier to fillibuster and to force Senate committees to vote on all bills. Both ideas were voted down on party-line votes. However, the Post missed what was the key rules change. The Senate has amended its rules to join the House of Delegates in prohibiting its members from offering constitutional amendments as amendments to another bill. This small change will prevent anti-gay marriage advocates from repeatedly trying to amend the Maryland Constitution as the Senate takes up other legislation. At the same time, it doesn't prevent the Senate in taking up the issue. Indeed, Sen. Rich Madaleno informs me that opponents of gay marriage have filed a bill defining marriage as between a man and a woman. The bill has 13 sponsors or cosponsors, 10 Republicans and 3 Democrats. The Senate has 33 Democrats and 14 Republicans. The three Democratic cosponsors are James DeGrange (Anne Arundel), Norman Stone (Balt. County), and Roy Dyson (Southern MD). The four Republicans who are not cosponsors are E.J. Pipkin (Eastern Shore), Andrew Harris (Baltimore and Harford), Allan Kittleman (Howard and Carroll), and Donald Munson (Washington). Read about Councilwoman Nancy Floreen's thoughts on Just Up the Pike. State Administrator of Elections Linda Lamone has long been the state's most ardent defender of the much despised touch-screen voting machines. In testimony before Sheila Hixon's (D-Silver Spring) House Ways and Means Committee, Lamone proposed allowing voters who don't trust the machines to vote on paper but says that there is not enough time to wholly switch voting systems. The time issue seems at least a bit of a red herring. Couldn't some counties shift to a new system even if there is not enough time for all to make the change? And even if we really cannot do it by 2008, shouldn't we begin a change now so we can do it by 2010? Otherwise, won't we hear the same excuses again after 2008? It seems that there is not enough time if we have a long debate over the new system but that we could make a shift if the legislature settled on an alternative in short order. Lamone's proposal is even more mysterious, however, because one would assume that operating two systems of voting might be more confusing than simply changing from one to the other. However, Lamone's proposal was not clear in the Gazette article. Is she essentially proposing that the state misuse provisional ballots and allow people who prefer paper to vote that way? Or is she proposing a separate set of paper ballots? If so, how would they be counted? Anyone out there have more information? At the request of legislators from District 18, the Montgomery County legislative delegation voted to support changes to liquor laws in the "metropolis", as Gov. O'Malley called it at Einstein High School, of Kensington. The changes, requested by the Kensington Town Council, would lower the food-to-alcohol requirement for restaurants to the level used in the rest of Montgomery County and hopefully make it easier for the Town to attract additional restaurants. Will MD Join DC on Cell Phones? Sen. Mike Lennett (D-Silver Spring) has proposed banning using handheld cell phones while driving. The District of Columbia already has such a ban. The Maryland Budget and Tax Institute has a nice, easy-to-follow "first look" at Gov. O'Malley's first budget. According to the New York Times, the Republican governor of Florida has announced a plan to replace touch-screen voting machines with paper ballots counted by scanning machines. The fifteen Florida counties affected by the change contain 54 percent of Florida voters. Replacing the machines will cost $32 million. "During the last four years, money has unfortunately been sucked away from the Purple Line," Sen. James C. Rosapepe, a College Park Democrat, said at an Annapolis rally yesterday. "Now with Gov. O'Malley, I think there's a need to expand our commitment to it." Sen. Gwendolyn T. Britt, a Prince George's Democrat, said the project is especially important to minorities and low-income families who often need to commute from one suburb to another, a pattern not well-served by the Metro system. "In my district, there are families and hard-working individuals who must take 2 1/2 hours on the bus, on several buses, getting to work," Britt said. But Sen. Richard K. Madaleno, another Montgomery County Democrat, said the light rail plan is a mistake. "You want to expand transit in places where you take people out of cars and put them on rail," Madaleno said. "This takes people out of buses and puts them on rail." The Purple Line has also generated opposition from users of the Capital Crescent Trail, a recreational amenity adjacent to part of the proposed light rail route. They petitioned to move the tracks or build the line underground as part of the Metro. Doing so will "increase ridership, expand Metro's ability to run alternate routes in emergencies and protect the trail," Del. Jane E. Lawton, a Montgomery Democrat said in a news release. Former District 16 Del. Nancy Kopp was reelected Treasurer by the General Assembly by an overwhelming margin. The Treasurer is elected by a joint session of the legislature in which each senator or delegate has one vote. MR. WILLIAMS: All right, Mr. President, the reports that 300 militants were killed, an American helicopter shot down yesterday in Najaf – that's one of the deadliest battles of the war, what can you tell us? PRESIDENT BUSH: . . . this fight is an indication of what is taking place, and that is the Iraqis are beginning to take the lead, whether it be this fight that you've just reported on where the Iraqis went in with American help to do in some extremists that were trying to stop the advance of their democracy, or the report that there's militant Shia had been captured or killed. In other words, one of the things that I expect to see is the Iraqis take the lead. . .
MR. WILLIAMS: Let's talk for a second about the State of the Union speech. You didn't mention Hurricane Katrina, New Orleans, or the Gulf Coast. A lot of people from Louisiana, including David Vitter, the Republican senator, say they regret that. Do you? PRESIDENT BUSH: Well, I gave a speech that I thought was necessary to give. On the other hand, I had been talking a lot about Katrina and about the fact that I worked with the Congress to get about $110 billion sent down to both Mississippi and Louisiana to help them on their reconstruction efforts. Obviously, there is more work to be done. But to take the housing issue, for example, we have sent money down to the Louisiana folks, Louisiana Recovery Authority, to fund their plan. And the money is there and the money is available. And now it's up to the folks down there to get this plan implemented so people can start rebuilding their houses. If there's bureaucratic slowdowns in Washington, we've got a man named Don Powell who is working to address them. But no, our response to the Katrina recovery has been very robust. And I appreciate the taxpayers of the United States helping the folks down there in Mississippi and Louisiana. Subtext: we've spent enough; any failings are the fault of those dumb locals who haven't spent the money well. Either that or he is setting up Powell to be the new "Brownie". I guess that one of the benefits of being part of a great rich nation doesn't entail your government coming in to give an assist in a crisis. MR. WILLIAMS: Now, also in the State of the Union, you talked about the – quote here – "the serious challenge of global climate change." Were you talking about global warming there? PRESIDENT BUSH: Absolutely, and it's a serious challenge. And one of the things that I am proud of is this administration has done a lot on advancing new technologies that will enable us to do two things – strengthen our economy, and at the same time, be better stewards of the environment. And I believe the goal I set, which is a very bold goal, of reducing gasoline usage by 20 percent in 10 years is an attainable goal, but it's going to require the Congress funding the research and development initiatives that I have put in my budgets. And I expect them to do so. So the idea that somehow I was trying to needle the Democrats, it's just – gosh, it's probably Texas. Who knows what it is. But I'm not that good at pronouncing words anyway, Juan. At the least the last bit was certainly correct. The entire SOTU had "Look Mom, I can read!" affect to it. MR. WILLIAMS: Mr. President, you're bringing out a new budget next week, and I presume you're going to have healthcare, health insurance plan in it. To pay for some of the plan, some people who don't pay taxes on their health insurance plan now will have to pay taxes. Isn't that a tax increase for them? PRESIDENT BUSH: No, really what it is, it's a rewriting of the tax code. We've got a tax code today that says if you get your insurance from a large employer, for example, it's part of your – it's a non-taxable event. And yet if you're an individual, like Juan Williams out there as an independent contractor, and you buy your own health insurance, you're at a tax disadvantage. MR. WILLIAMS: So, some people would say, well, if you believe in spending restraint, why haven't you vetoed one bill, you know, one appropriations bill? PRESIDENT BUSH: Because the United States Congress that was controlled by Republicans exercised spending restraint. Remember, discretionary non-defense related spending has increased by far more than during Lyndon Johnson's Great Society. Regardless of what you think of Johnson's programs, at least he was trying to help people. And to think that President Bush ran on integrity and honesty in 1992. Former MD Senator Paul Sarbanes will talk about his life and political career on the "Political Pulse" TV Show on Thursday, February 1st at 9 p.m. and Tuesday, February 6th at 9:30 p.m.
As a young Congressman on the House Judiciary Committee, Senator Sarbanes introduced the first Article of Impeachment against then-President Richard Nixon. Senator Sarbanes will talk the Impeachment hearings, his vote on the Iraq War Resolution (he voted against it), his humble beginnings in Salisbury, Maryland and other matters.